» Articles » Sharp Tips » Numbers On The Fertilizer Bag--What Do They Mean? 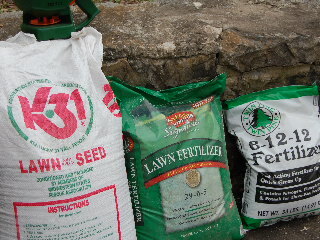 Numbers On The Fertilizer Bag--What Do They Mean? What’s up with those numbers on the fertilizer bag? You just want to get the right product to help you grow a lush green lawn or maybe produce the biggest tomatoes your home garden can provide. How can you interpret this mysterious numerical code (which reminds you more of your old high school locker combination than of helpful gardening information) and unlock the key to horticultural happiness? First of all, let’s accept the fact that there is indeed a bit of a code to it all. The numbers actually stand for letters—the letters being N (nitrogen), P (phosphorous), and K (potassium). And those magic numbers reveal the percentage (by weight) of these three important plant nutrients contained in your bag of fertilizer. Let’s clear up one mathematical misconception before we go any farther. Perhaps you’re wondering why that 50 pound bag of fertilizer that you paid full price for has an analysis of 12-12-12—which would add up to only 18 pounds. What's the deal on the other 32 pounds? This would be “filler” such as small pebbles or other non-nutrients that help the product move smoothly through your spreader. Or, possibly, your bag of fertilizer also contains some trace nutrients like iron or manganese in addition to the big three. If it does, these will be listed on the bag. That’s the math—now on to the science. The first number tells the amount of nitrogen in the bag. Plants need nitrogen for top growth—in other words stems, leaves, and stalks. An adequate amount of nitrogen is especially important, as you might imagine, in the growth of a healthy deep-green lawn. As a general rule, nitrogen leaches from the soil rather rapidly and needs to be re-applied on a regular basis in order to maintain consistent color and steady plant growth. The second number indicates the amount of phosphorous in your bag of fertilizer. This valuable nutrient is necessary for healthy root growth and for the consistent production of flowers and fruits on your plants. Phosphorous tends to remain in the soil quite well and does not need to be re-applied so frequently in order to maintain good levels of availability to your plants. Potassium is the third number in the fertilizer analysis. Sometimes called “potash”, this unglamorous element is the all-purpose workhorse of the big three—its duties being many and varied. Potassium helps the plant maintain its overall health, vigor, and disease-resistance. It too (like phosphorous) aids the plant in the development and growth of a strong healthy root system. It also promotes vigorous growth by aiding the plant at the cellular level in the photosynthetic process of food manufacturing. A plant lacking in sufficient amounts of potassium is often weak and slow growing. Like nitrogen, potassium also leaches from the soil rather quickly. Now that we know what these numbers mean, how can we use them to be more productive gardeners? Let’s take lawn grass as our first example. We know we need a good amount of nitrogen to promote a deep green color and healthy top growth. But now we know we also need an adequate amount of phosphorous in order to establish a deep healthy root system. 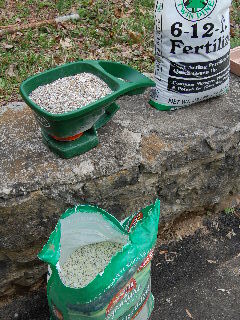 This is vital in establishing a new lawn and is the reason you will see a relatively high percentage of phosphorous in a bag of starter fertilizer. How about our flower garden or maybe the vegetable garden where we want to harvest those big red tomatoes? Here we need not so much nitrogen and more phosphorous with some potassium for big blooms and healthy hardy fruits. If everything else seems about equal in the general vigor of your garden, maybe a good balanced fertilizer like 12-12-12 is sufficient—especially if you’re growing a mix of different kinds of vegetables and flowers. You get the idea. And now when you see those numbers on the fertilizer bags at your garden center, your thoughts will turn to healthy lawns and tasty tomatoes instead of to thoughts of how hard it used to be to get your high school locker open anyway!